Are you looking for something fun to do with your crew this Family Day long weekend? Perhaps it’s just fun day out in the snow with friends. Whatever you have in mind, the zoo has something for you to make this long weekend extra memorable! Here are some suggestions to help you plan your visit. BONUS! Warm your waddlers this February from the 19th to the 25th. The first 100 guests through the gate will receive a free hot chocolate- a perfect treat to combat the cold weather that Calgary has been experiencing. 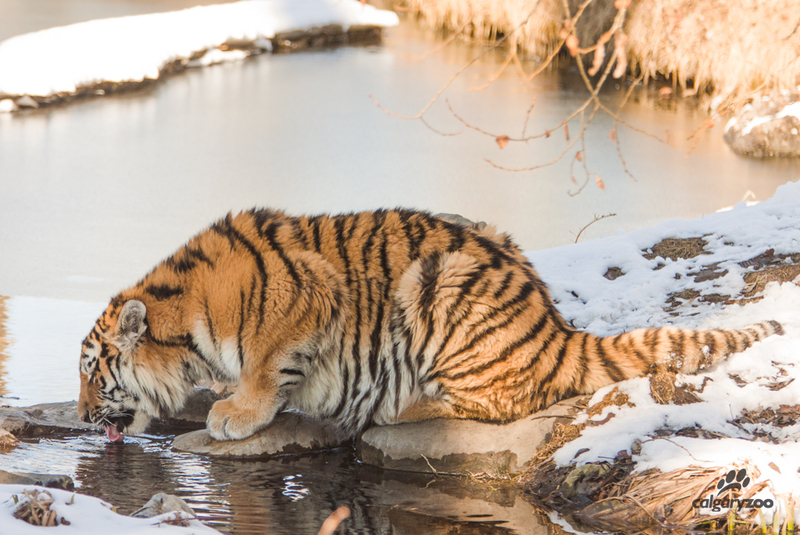 Treat yourself to a cozy drink while you watch the penguins strut their stuff. 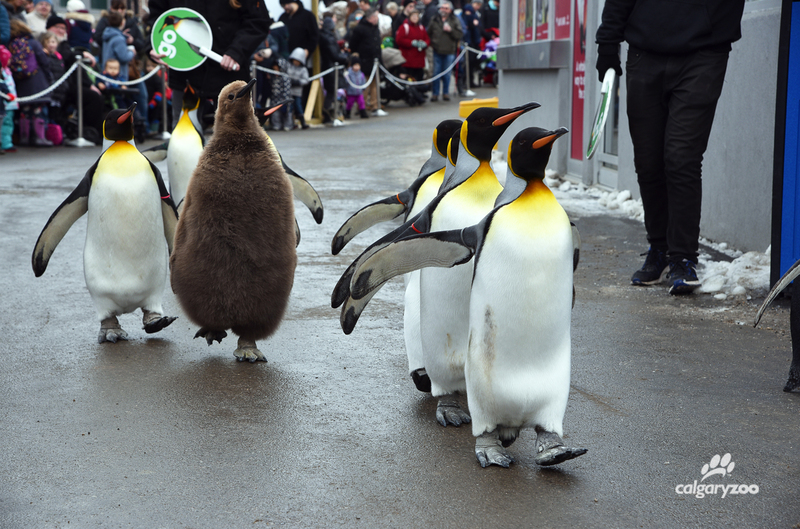 Penguin Walk has begun for 2018! This year’s chick, Cleopatra, is a fluffy fellow waddler- keep an eye out for her! 2. Walkin’ in a winter wonderland. Make the most of the idyllic snowy scene and stroll through Canadian Wilds. Don’t forget to to visit Cequel Lodge and meet our river otter family. Whether it’s warm or chilly this weekend, our otters roll with the elements- and they have the best otter swimming pool around. See if you catch them on the slide! 4. 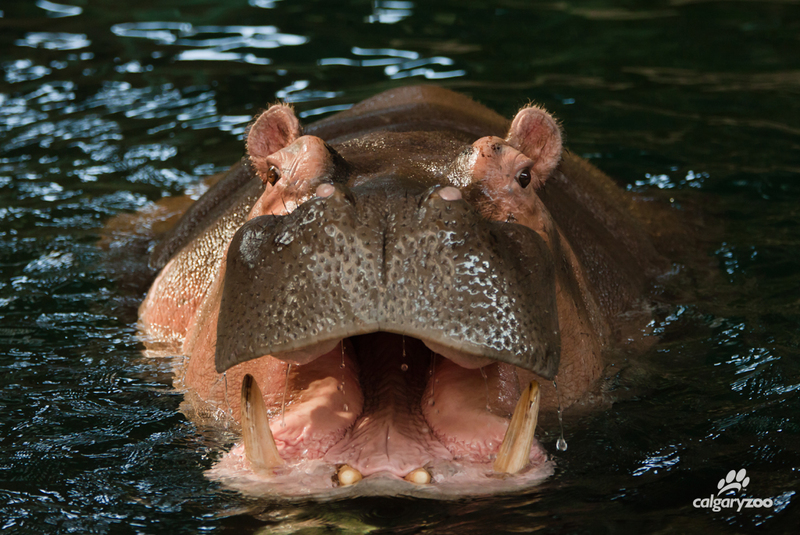 Don’t miss seeing our hippos during the daily 1:30 p.m. Hippo and Giraffe Keeper Talk! Witness them show off ‘big mouth’ for the keepers, get a dental check up, and splash around the pool. After you’ve learned all you can (hippos can hold their breath HOW LONG!? ), check out the rest of the African Savannah– including our growing slender-tailed meerkat family, Egyptian tortoises, or porcupines. 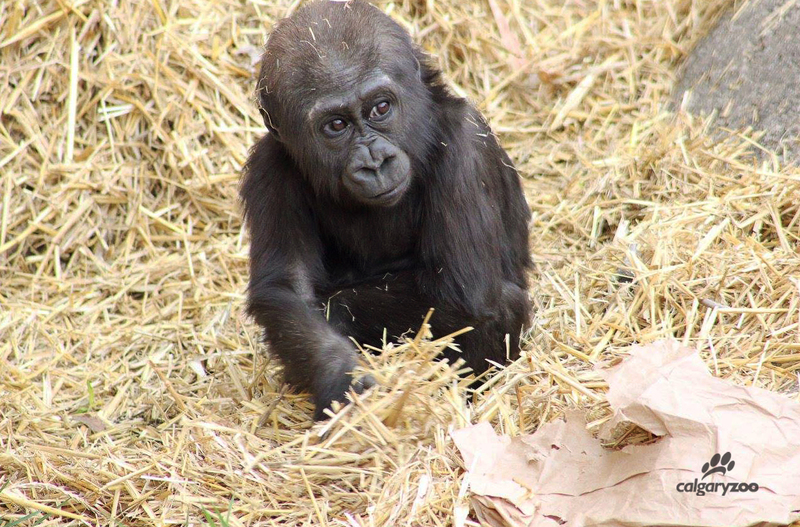 Our young western lowland gorilla Kimani is the darling of our troop. 6. Take a break from running around and bask in the balmy tranquility of our indoor gardens in the ENMAX Conservatory. The Garden of Life is home to some fascinating plants, including trees bearing pomegranates, olives, coffee and…. chocolate!?? On your way out of the gardens, snap a selfie in the biggest red chair you’ve ever seen! 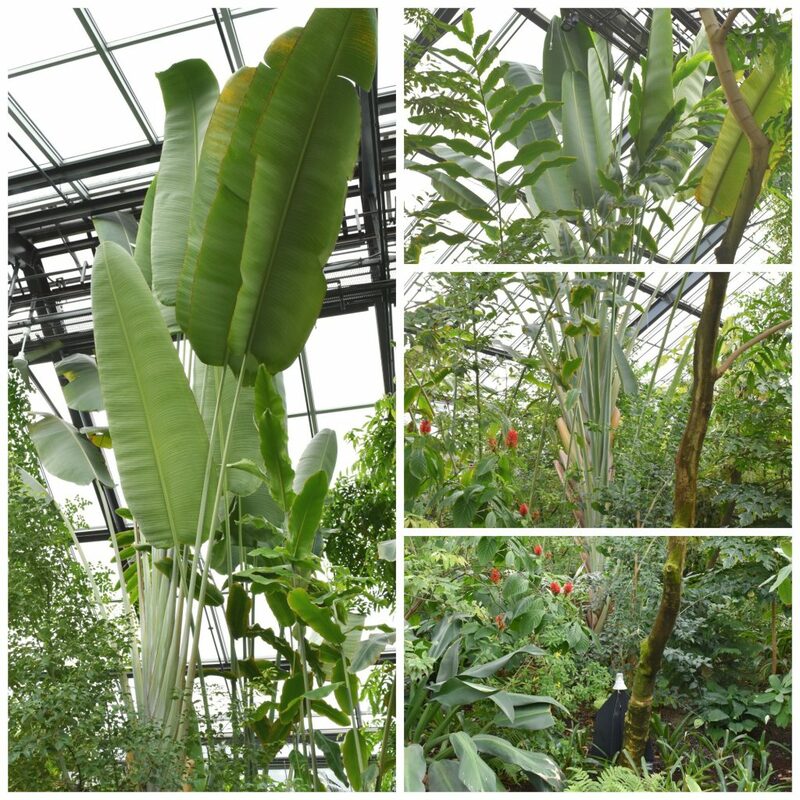 What wonders will you discover in the ENMAX Conservatory? 7. Need to refuel? Head to Kitamba Café for some hot food and tasty beverage. Whether you’re looking for steaming soup, fresh salad, or the classic burgers and fries fare, there’s a little treat for everyone to keep them going during a busy zoo day. A great ‘perk’ is the Starbucks coffee served at our adjoining cafe- Kitamba Java. 8. Check out a free program. A great value add to your visit, you can attend a keeper talk, learn from an interpreter, or meet an animal up close at a Creature Feature. 9. 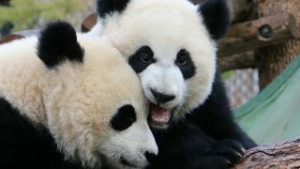 What’s the cutest sigh in Eurasia? Why, it’s the red pandas of course. Our newest cub in Eurasia love to play in the snow, and can often be found climbing trees and wrestling with each other. Don’t just take our word for it…. 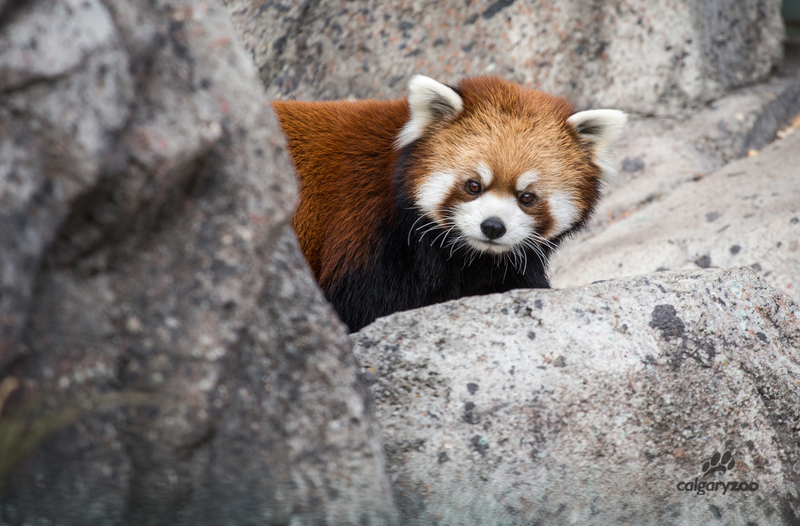 The zoo’s 2017 red panda cub is named Nisha! We have entered 2018 with a renewed passion for sustainability, conservation, and a determination to continue to save species. The support of our zoo family, volunteers, visitors and donors means the world to us, and enables us to continue our mission. Your visit to the zoo helps support wildlife conservation and lends a hand to sustain wildlife and wild places!